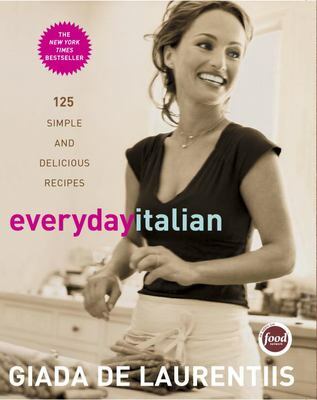 Two weeks ago I made an amazing, but simple recipe from her Everyday Italian cookbook. Pour over chicken pieces. Cover and refrigerate for at least 2 hours and up to 1 day. Preheat oven to 400 degrees. Roast the chicken uncovered until cooked through, about 45 minutes. 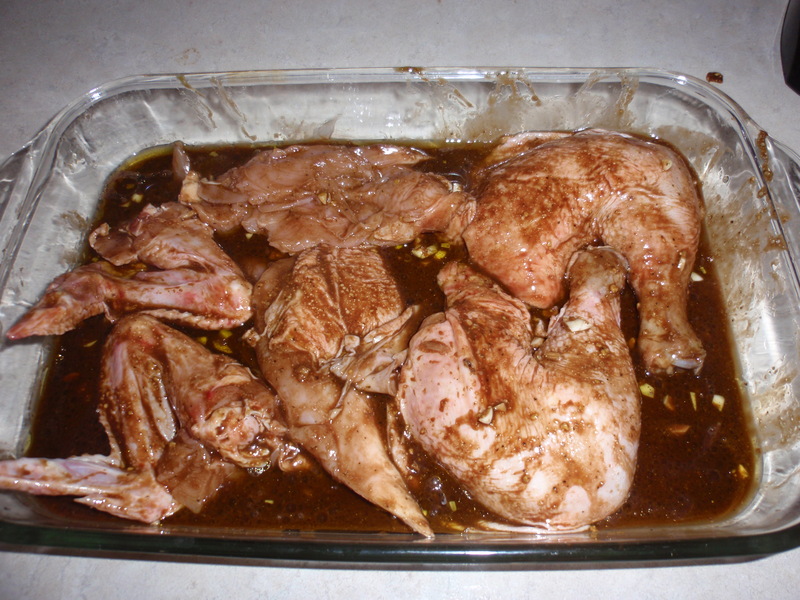 Using tongs, transfer the chicken to a serving platter. Carefully pour the cooking liquid into a small, heavy saucepan and spoon off the excess oil from atop the cooking liquid. 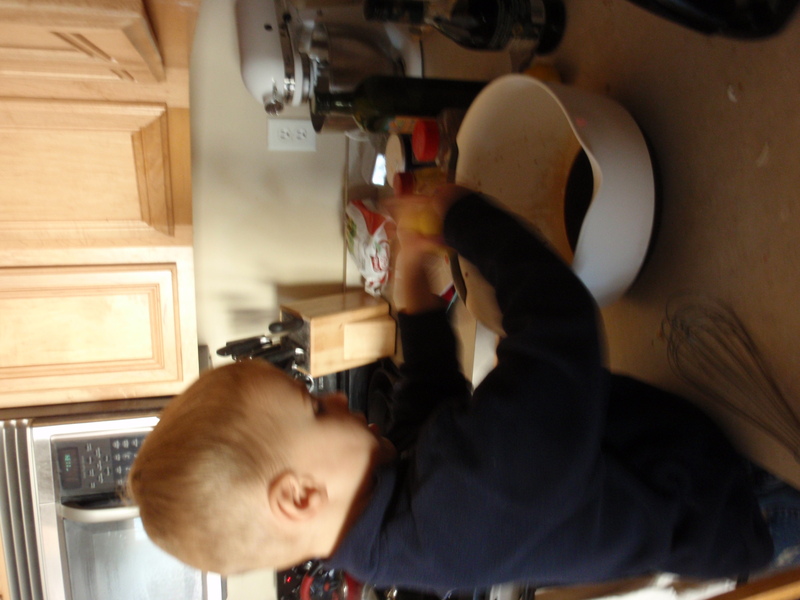 Boil until the liquid reduces by about half and thickens slightly, about 8 minutes. Pour the sauce over the chicken. 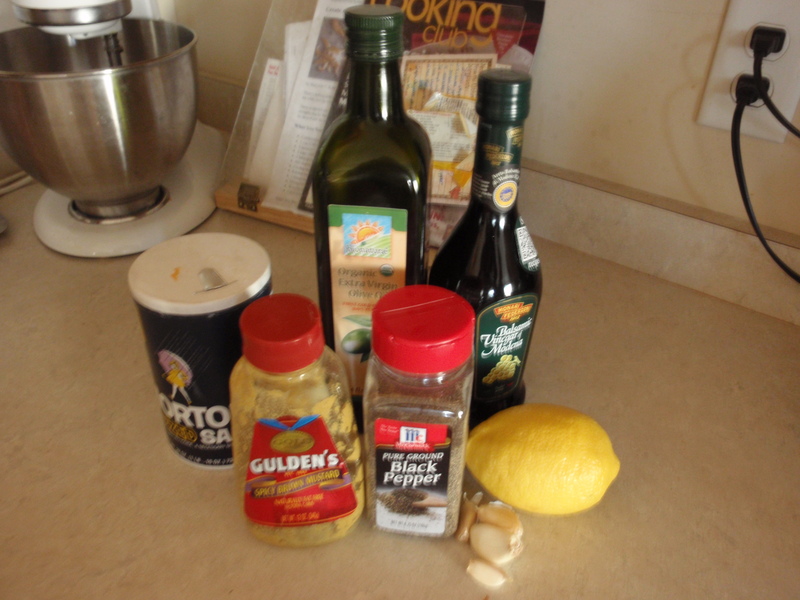 Sprinkle parsley and lemon zest over the chicken and serve. This was fabulous!! Serve with mixed greens salad, brown rice and a cold glass of Organic Valley milk. I had to post one last pasture picture of the season. Tim is bringing our cows in for their evening milking. What is your favorite Bratwurst flavor? When the last of our pigs were butchered at Lorentz Meats, they informed us that they were no longer going to process pork. Instead they were going to focus their business on beef and buffalo only. We love Lorentz and will still use them for our beef, but that meant we needed to find a new pork butcher. We have used Odenthals Meats for small orders in the past and really like what they do. 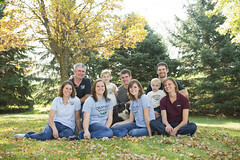 Lisa contacted the owners, Randy and Laura, and we are happy to bring our family business to their family business. Check out a cute video of them on their website’s homepage. The Odenthals have been in business since 1999 and Randy’s philosophy was the same as it is today: “Please the customer by providing the highest quality and best tasting homemade products in the area.” Learn more about their family business here. An exciting element of switching butchers is that we can now offer new products. Randy is willing to work with us to develop new custom bratwurst flavors. (And don’t fear if you loved our wild rice brats, Randy Odenthal was given the recipe from Lorenz). We want to hear from you about which flavors of bratwurst you are wanting to try. Even if you are not a customer, go ahead and vote. We love to hear what people love to eat. Please leave a comment about your favorite brat flavor. Also, tell us which region of the country you are from. It is interesting to see what is favorites in different regions. PS If you are a customer of ours, please get on our pork list quick. Butchering dates are coming up soon and we don’t want you to be left out of delicious nutritious pork this year. Call us at 952-461-3428. Check out our website to learn how custom ordering works. Surprise! You are Being Inspected!! Part of the USDA Organic Certification rules is that farms can be inspected at any time. This is to ensure that they are meeting all the National Organic Standards Board’s rules and regulations. 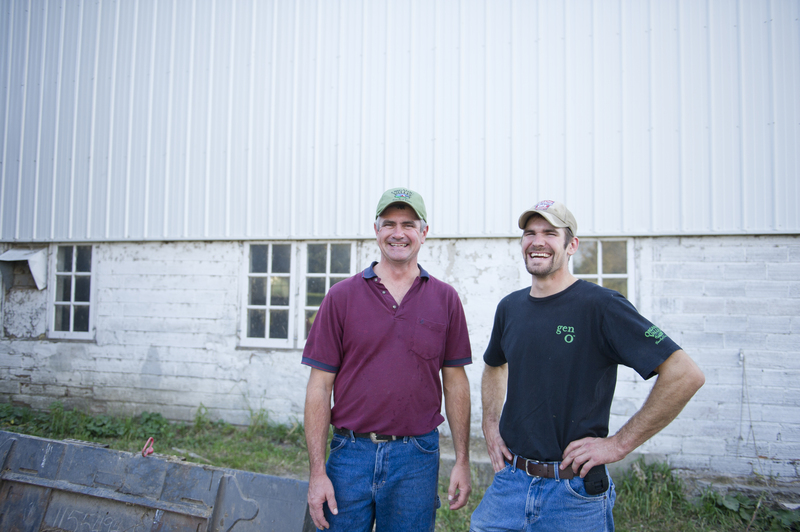 All farms get an annual surprise inspection by their certifying agency. It truly is a surprise. We have never been inspected in the same month. We got our “Surprise, you are going to be inspected” call recently and yesterday the inspector came out to review our paper work and make sure EVERYTHING on the farm was in compliance. The inspectors don’t give you much notice, usually a few days. It is enough to rearrange any plans you had (if you were going to be off the farm), but not enough time to “cover up” any mistakes. If a farm was cheating, they will be caught. Being inspected is serious business. The inspectors don’t care if you are in the middle of a (now a week late) hay harvest like we were or if you are trying to get crops planted or harvested. When the inspector comes you stop what you are doing. Unlike our Grade A milk inspection, where the inspector comes, does his work and leaves without speaking with us, we need to be with the inspector during the organic inspection. She tours our farm, looks in barns and holding areas, views our pastures and fields, inspects all medications we are using, and more. After the visual inspection, she sits down with (usually) Tim, since he does the paperwork, and reviews ALL our organic certification paperwork. This includes pasture and housing records, manure application records, field planting and harvest records, animal health records, etc. The whole process yesterday took about four hours. Often organic farms get a bad rap that we are some how “cheating” the system. I think that if anyone saw how thorough our paperwork has to be or how intense our surprise inspections were, they would not question if we were following the regulations. Well, we passed the inspection with flying colors. Everything we are doing is within the rules and regulations. 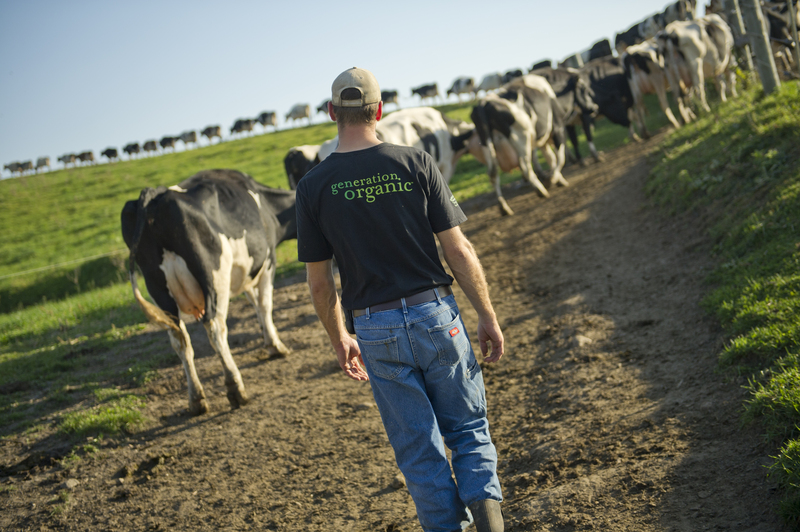 We can continue to produce milk for you and your family under the organic label. If you ever have any questions on this process please let us know. You can email us or leave a comment. We are happy to answer your questions. 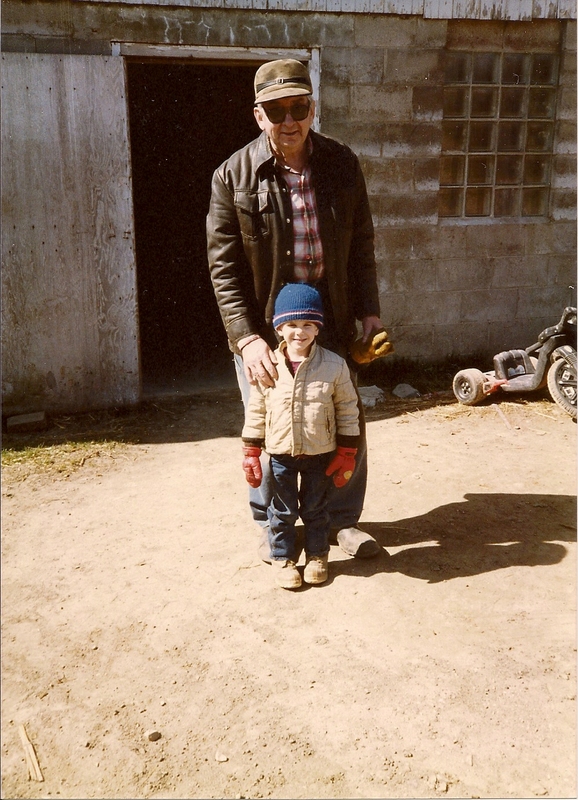 I grew up on a small hobby farm where we raised about 100-200 chickens for meat each year. Anyone in our extended family who wanted to “buy” some chickens from us, had to come help on butchering day. Needless to say, I knew all about the parts of chickens. 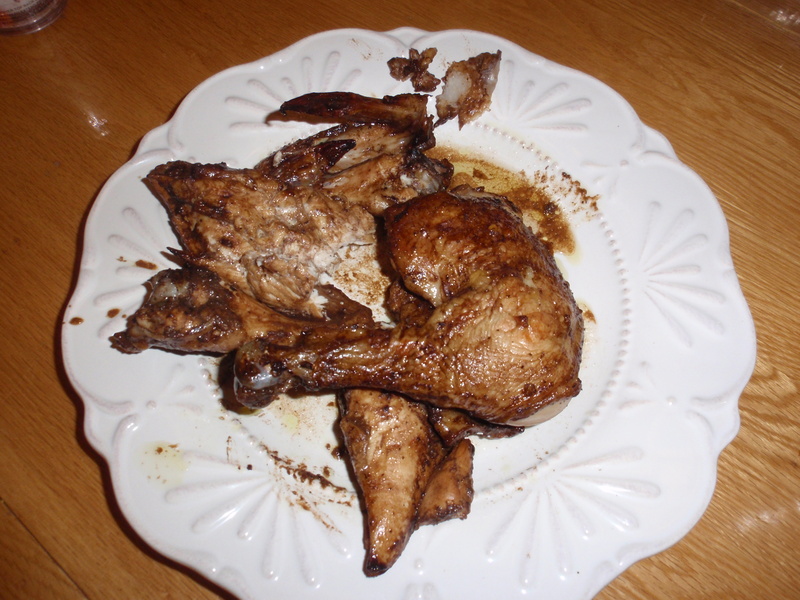 Each week my mom would roast a whole chicken, then my dad would clean the leftover meat off the bones. 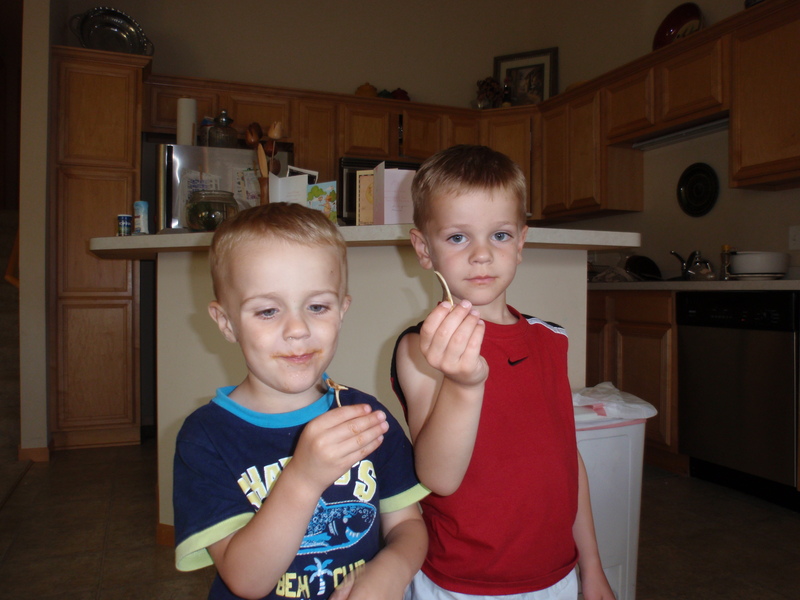 A wonderful family memory of mine is the breaking of the chicken’s wishbone. Wishbone lore says: when broken by two people, the person who gets the bigger part will have their wish granted. Since there were three kids in our family, we regularly fought over who got to break the wishbone. It was a big deal to us. I wanted to bring back that tradition to my children as well. As I was cleaning the leftover meat off our roasted chicken this week, I wondered how many kids, or even adults, have ever seen a chicken’s wishbone. Purchasing a whole chicken is so rare now days, that we often get asked “How many breasts does your chicken have?” FYI: Chickens do not have four boneless skinless breasts. 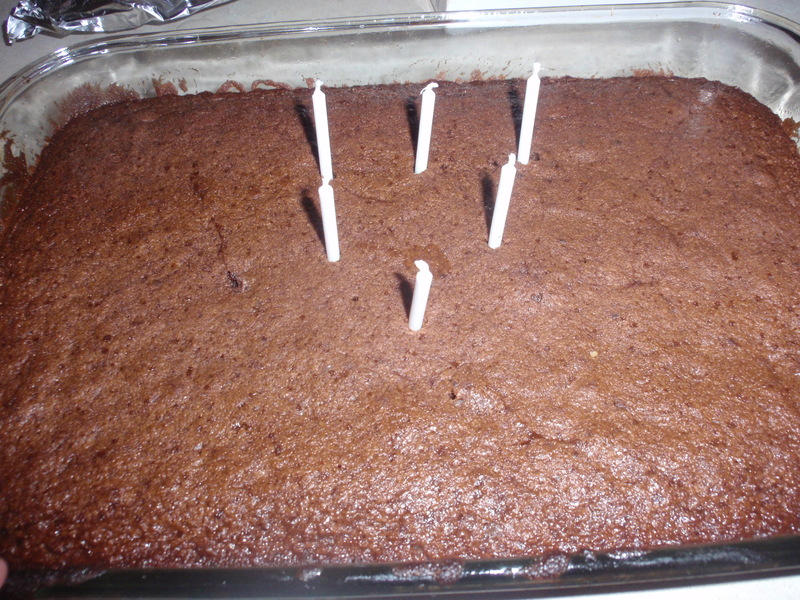 This week when the boys were about to break their wishbone, I asked them what they wished for. Erik wished that no one would take his things (we are having sharing issues) and Jonnie wished for a sucker. Jonnie won, but he didn’t get his wish (until Papa sneaks him one at the barn). I hope this fun tradition will stick. We eat at least one whole chicken each week. That is a lot of wishbones and a lot of wishes! Do You Live in a Rural Food Desert? Yesterday, I saw a post on Grist.com about food deserts in rural areas. Welcome to the Food Deserts of Rural America. The post is from January 22, 2011, so it is a little dated, but it is a very relevant topic. A food desert is any area that has limited access to quality or a variety of food. Many people think of urban areas when it comes to food deserts, but a growing concern are the food deserts popping up in rural America. A big problem in rural America is the migration out of these areas. As people leave, so do the customers for local businesses. But what I feel is the biggest problem is the lack of quality food sources coupled with an aging population in these areas. As the age of rural residents increases and their access to transportation decreases, their options become less and less. I do not consider myself living in a food desert, even though I need to travel 20 miles to get to a grocery store, but the only option in our town is a small gas station. If I was a resident without access to transportation, my food choices would be packaged, pop, some frozen pizza and french fries, a few dairy items and MAYBE apples. Our town is currently building a senior living facility, but I wonder if it is smart. Should we be concentrating a senior population, who may or may not be able to drive, in an area without access to quality food? Will there be residual consequences (ie health, etc) because of this? Despite this I had the idea of possibly using our abilities on our farm to bring quality food to the facility. I only thought of this today and haven’t even looked into it, but maybe it will be a possibility to bring food (like a farmers’ market) to them. What are your thoughts on rural food deserts? Do you live in one? If you live in a rural area do you have access to quality and a variety of food? Let’s continue this conversation. I believe everyone deserves access to quality food. Sorry for not posting much last week. I was reading an incredible book that I couldn’t put down. I recently joined our church’s Mom’s Book Club and the first book I was assigned was a doosey. We only needed to read the first 60 pages in two weeks, but I read the whole book front to cover in three days. What a journey it was. The book is “Left to Tell” by Immaculee Ilibagiza. Immaculee is a survivor of the 1994 genocide in Rwanda. She story of faith, survival, sorrow and forgiveness is a must read by anyone of any faith. Despite the horror she lived through (and the demons that still haunt her) she has opened her heart to God’s love and is working to forgive those that brutally killed her family, friends and neighbors. Since reading this book, I have been reflecting a great deal on the acts of forgiveness, love and hate. While the events in Rwanda seem far away and so unreal, those with hate in their hearts can be anywhere and many of them are people near us. An issue Immaculee struggles with in the book is: can you have justice and still forgive and love for those that persecute you? Her answer is yes. In our country, not many of us are being persecuted. Yes, we all have our daily struggles and crosses to bear, but 1 million are not being hunted like savages just because of their ethic background (like Rwanda). But still it seems that even “small issues” (in comparison to genocide) turn people against each other. I personally feel that our country is widening our divides on almost every issue it seems and if we look for middle ground, we are judged as being “sell outs” or weak. Even in the area of food and food production there is extreme divide and feelings of hate toward the “other.” Tim and I have come to know a wonderful person that has been a victim of hate crimes because of the way her family chooses to care for their farm animals. Every time I hear her speak, I reflect on the persecutor and what must be in their heart. This family is kind and gives the utmost to their animals, yet is a victim of hate. I know of another family that for awhile would not allow their children to get off the bus at their house because of the death threats their family was receiving, all because of the way the chose to raise their livestock. I personally know that this family also believes in quality care for their animals. I believe it is perfectly okay to have passion for your beliefs and stick true to your values all while not hating those that see things different than you. Often hate is manifested by fear and mistrust. Those that encourage hate, often use the tactic of blaming an intangible thing (ie a company, religion, etc). This way it takes out the human element. It is much easier to hate a “thing” than a person with a family, hopes and dreams. So the next time you witness hate, take a step back and dig deep in your heart. Is hate really the answer? Or can we solve some of the world’s biggest problems, not with hate, but with more love, understanding and compassion? I think we can. This is day three in our quest to find out if organic foods are really affordable or if they are something reserved only for the elite. If you didn’t see my post yesterday, go and take a look. We had three very square meals (even steak for dinner) and it only cost $6.77/person for the entire day! That is what I call affordable. Now on to day three. I am guessing today will be even cheaper. I helped with calf chores tonight and decided to make dinner a left over event. Let us run the numbers and see. Breakfast: Homemade Oatmeal Pancakes (see breakdown below $2.29 ), milk (organic $4.50/gallon) and fried apples (organic 3lbs for $4.99) and maple syrup (organic $20.00/32oz). Dinner is easy. The boys ate over at Grandma and Papa’s. I had left over tacos ($2.30). I had made double batch of taco meat, so I will add my meal to the total.Tim had left over steak from last night and since I counted his steak last night, I won’t add it again here. Today’s grand total? $16.30! Can you believe it? So who are all those people out there that say buying organic food is too expensive and unaffordable? I am starting to prove that if you choose to eat organic food, you don’t have to break your pocketbook. Organic food can be affordable. I really believe that the trick is to skip the processed foods. Organic cereal, deli meat, chips, etc. can really be expensive. We do buy chips to have as a snack, but I am also a huge popcorn fan. I can buy organic white popcorn for$1. 42/lb. This will last me two weeks if I eat popcorn everyday. A bag of chips costs us $3.60 and will last us three-four days. 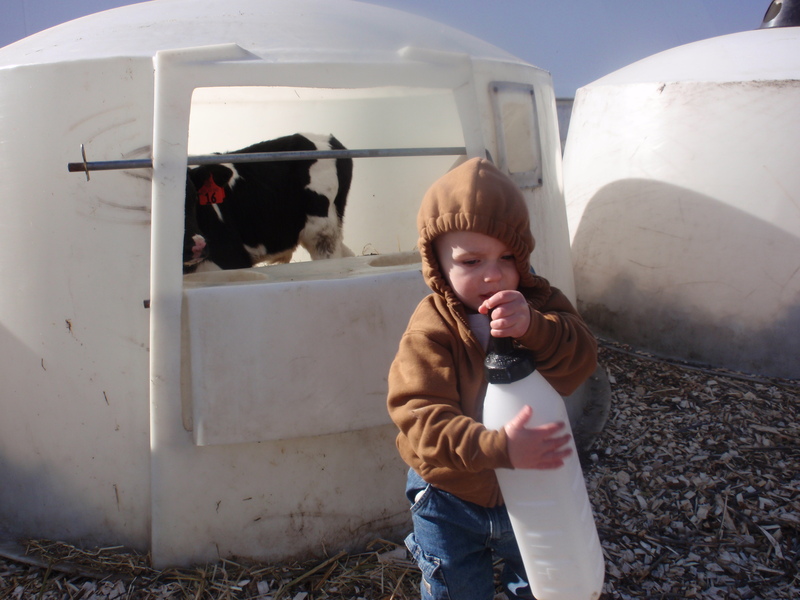 Notes from the farm: No babies born today. We have several mothers in waiting. I hope to take some pictures when their cute little calves arrive. Today we also had AWESOME weather. It was 65 degrees, sunny and a gentle breeze. We cannot ask for more in March. They are talking rain/snow on Saturday, but it is expected this time of year. Now is a time for waiting on our farm. Waiting for calves to be born, waiting for fields to dry up and waiting for grass to grow.